A defect in the heart happens when either the heart, or the blood vessels that connect to the heart, do not develop normally before birth. The terms “congenital heart defect” and “congenital heart disease” both mean that the defect happened before birth. The cause of most heart defects is often not known. At least eight of every 1,000 infants born each year have a heart defect. Sometimes the defect is so mild that there are no outward symptoms. Other times, it is so severe that your baby may become ill soon after birth. Some heart conditions occur later childhood. Some may have a genetic cause. 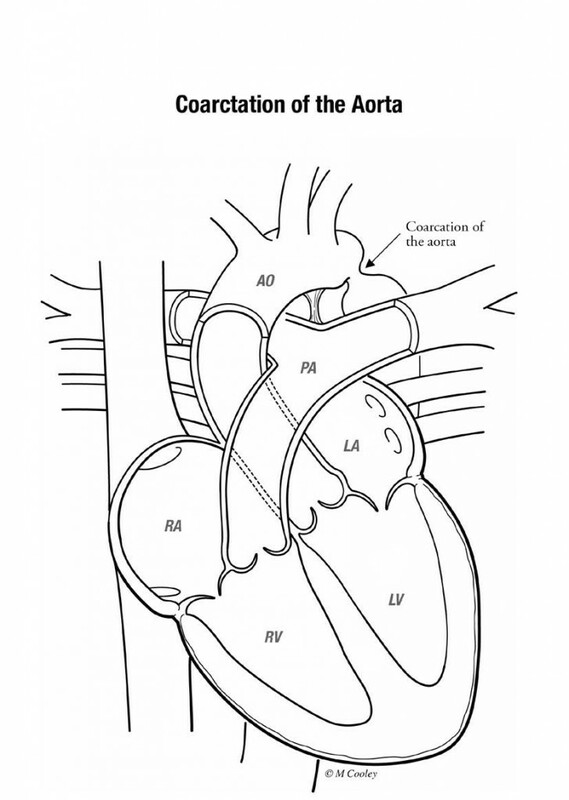 Function of the normal heart after birth When the heart forms normally, it has four chambers. The upper two chambers are called the atria. The lower two chambers are called the ventricles. 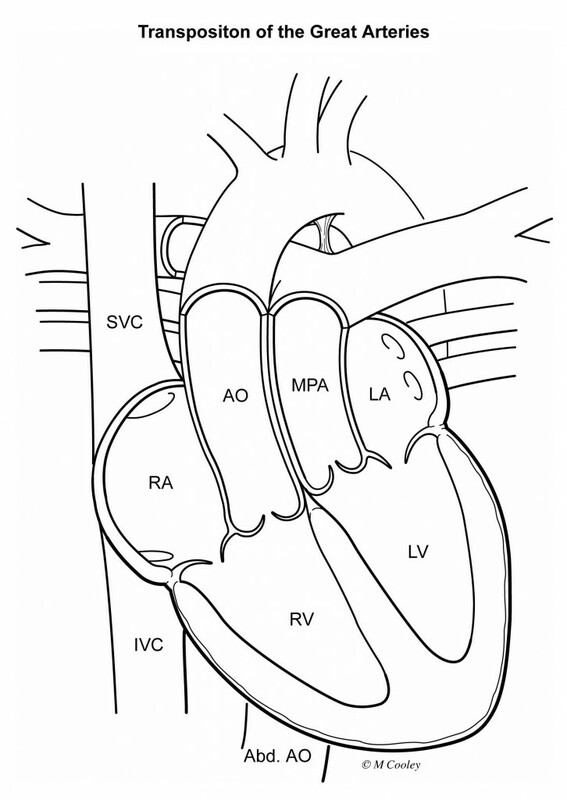 When the heart forms normally, it has four chambers. The upper two chambers are called the atria. The lower two chambers are called the ventricles. The atrium receives the blood and the ventricles pump the blood. 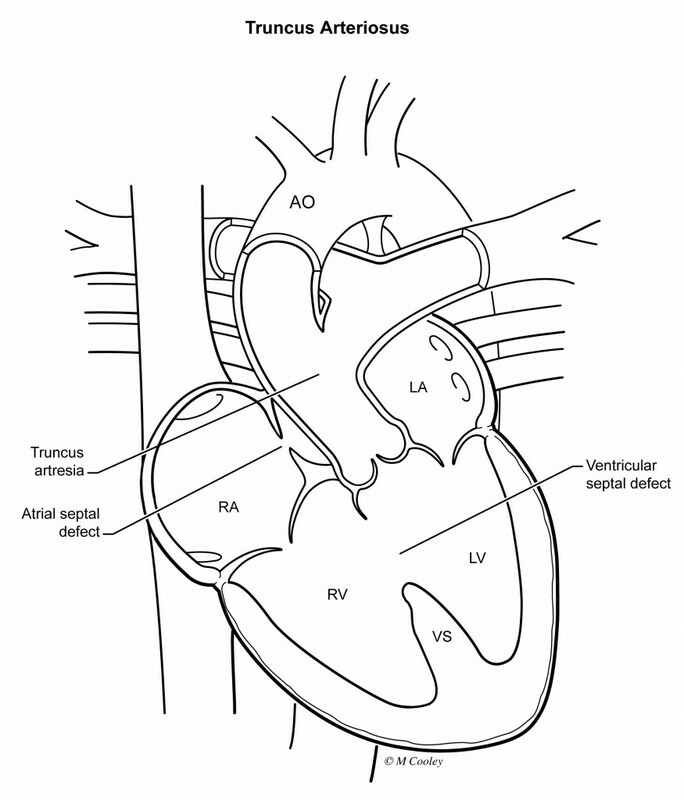 Oxygen-poor (blue) blood returns to the right atrium from the body and travels to the right ventricle. It is then pumped through the pulmonary artery into the lungs where it receives oxygen. Oxygen-rich (red) blood returns to the left atrium from the lungs and passes into the left ventricle. The blood is then pumped out to the body through the aorta. 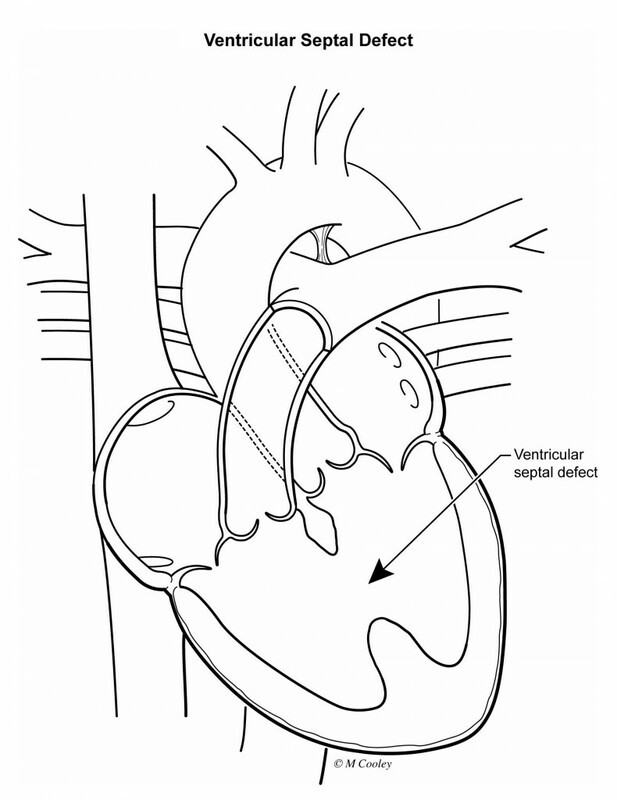 Atrioventricular Septal Defect (Endocardial Cushion Defect, Atrioventricular(AV) canal defect): There is a large hole in the middle of the heart typically involving the valves, the upper chambers of the heart (the atria) and the lower chambers of the heart (the ventricles).Tricuspid and mitral valves do not form separately. Instead, one large valve crosses the defect. This is seen more often in children with Down syndrome. Typically, surgery is needed within the first year of life. 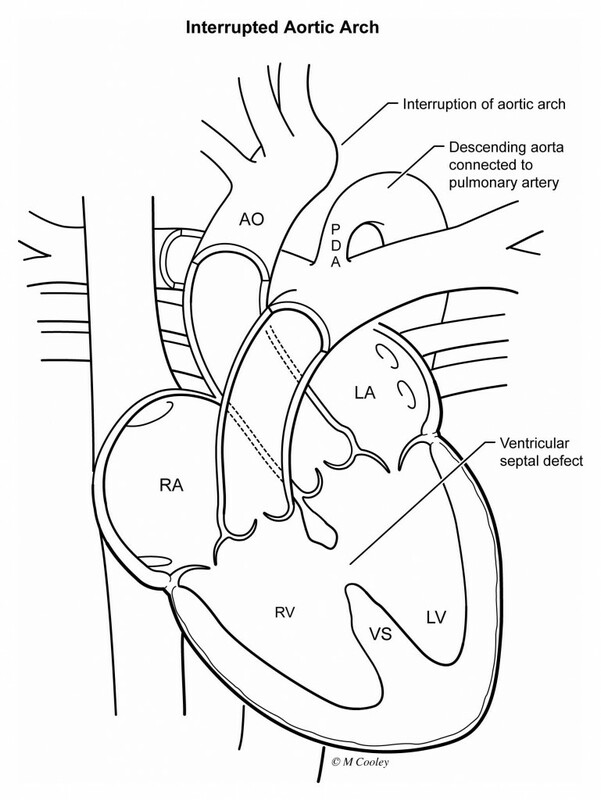 Interrupted aortic arch (IAA): An interrupted arch happens when the aorta does not form correctly. 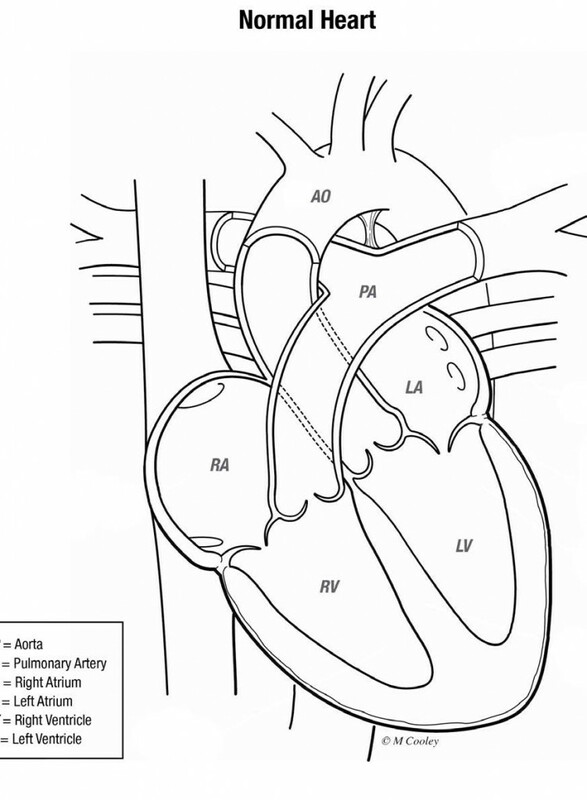 The ascending aorta and the aortic arch does not connect to the lower part of the aorta.The lower part of the aorta is supplied by another blood vessel called the patent ductus arteriosus, PDA. 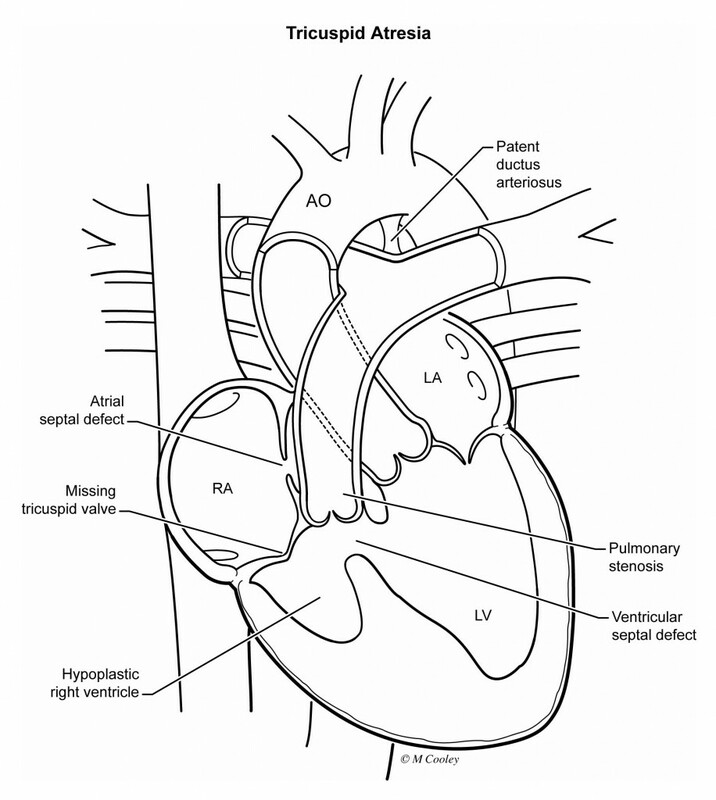 IAA also usually involves a hole in the lower heart chambers called a VSD. 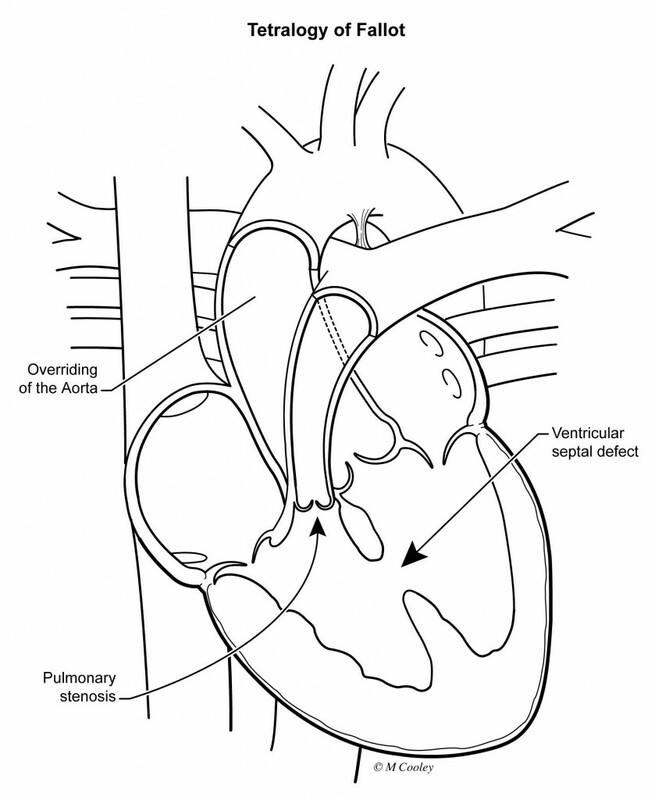 Pulmonary Stenosis: The pulmonic valve is stiff and has a narrowed opening. It does not open properly, which increases strain on the right side of the heart because the right ventricle has to pump harder to send blood out to the lungs. Overriding of the aorta: The aorta (major artery that supplies oxygen blood to the body) normally comes off the left ventricle. 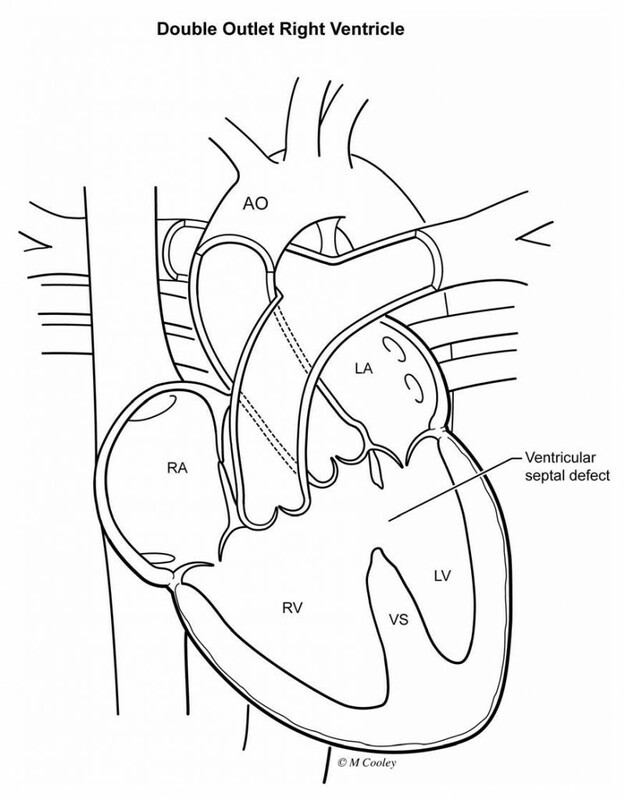 In TOF, it sits over both the ventricles and “straddles” the VSD. You may have a prenatal ultrasound while you are pregnant to learn about the health of your baby. If there is concern that there may be an abnormality in your unborn baby’s heart, the doctor will schedule you to have a fetal echocardiogram. A fetal echocardiogram is a special ultrasound used by a pediatric cardiologist to look at your unborn baby’s heart in fine detail. There are some limits to fetal echocardiogram. Some cardiac problems cannot be seen until after birth. After the test, doctor will review the results with you. If your baby has a congenital heart defect, the pediatric cardiologist will discuss the treatment options and prognosis. Your doctor will have a detailed plan to watch your pregnancy very closely. Ideally, you will be able to have a normal vaginal delivery. If you need to have a cesarean section (C-section), your doctor will discuss this with you. It is important to call your doctor if you have any questions or concerns during your pregnancy. If this problem is found while you are pregnant, you will continue to receive care from your doctor. Your doctor may refer you to the Ohio Fetal Medicine Collaborative (OFMC). Through the OFMC, you will see a doctor who specializes in the care of high-risk patients. You will also meet with a pediatric cardiologist and a heart surgeon at Nationwide Children’s Hospital. They will tell you more about your baby’s heart condition and the care your baby will receive after birth. You will also have the opportunity to meet with a Neonatologist (a doctor who specializes in treating newborns) while you are pregnant to learn about what will take place in the delivery room. Nurse coordinators will be available to help answer your questions and concerns, guide you through your pregnancy, and prepare you for what to expect. You will deliver your baby at a hospital that is prepared to care for high-risk babies. At the delivery hospital, the neonatologist will supervise care of your baby. The doctor will explain the necessary care for your baby based on the heart condition. Some heart problems have to be fixed within the first several days to weeks after birth. Other problems can wait until the child is older. Your baby may be able to breastfeed or feed from a bottle and go home with you. Your baby may be taken to Nationwide Children’s Hospital, Main Campus Intensive Care Unit for further care. 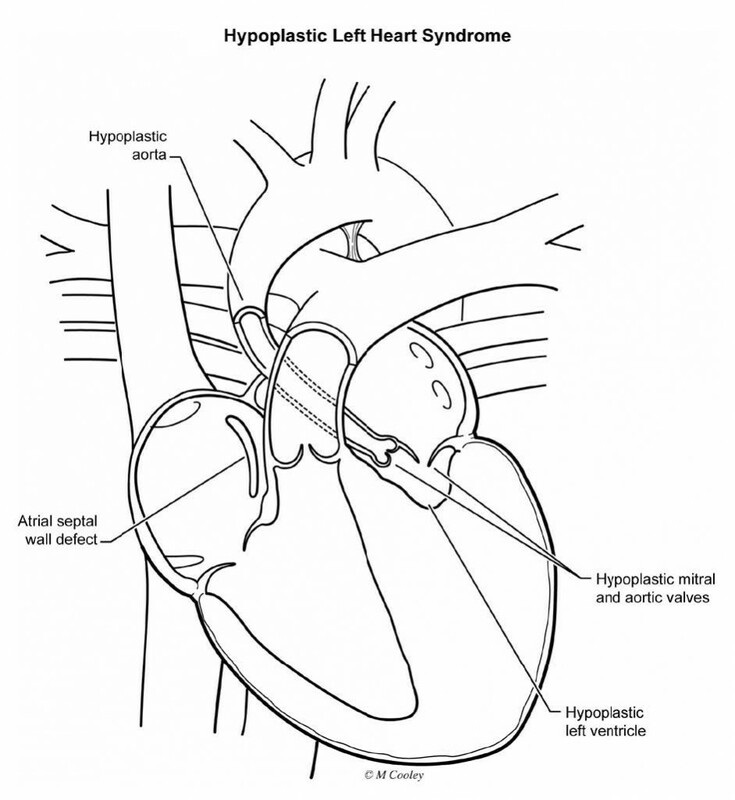 The decision about surgery is based on your baby’s heart problem. Some heart problems have to be fixed within the first several days to weeks after birth. Other problems can wait until the child is older. Sometimes the repair takes more than one operation. To learn more about surgery, visit NationwideChildrens.org/Congenital-Heart-Defect-Corrective-Surgeries. Feedings begin once your baby is stable after surgery. Breast milk or formula feedings are started very slowly in either the bottle or the NG tube. Babies who have a heart defect may tire easily while feeding. Many babies who have heart disease need medicine to make their heart stronger or to prevent other problems. It is very important to give the medicine just the way your doctor tells you. Your baby may also need to take the medicine when you go home. The total length of time your baby will stay in the hospital will vary. It will depend on whether your baby is born with other health issues; the type of defect he or she has, and if surgery is needed right away. The usual length of hospital stay is 2 to 4 weeks after surgery. You will be able to take your baby home once he is taking all foods by mouth and gaining weight. Most babies recover very well. Even if they need to take medicine, they will grow and develop. Your baby will need regular follow-up appointments to measure growth, development and nutrition. You will want to find a local pediatrician to take care of the routine checkups, immunizations, and doctor’s visits. The program coordinator can help if needed. The pediatric cardiologist will follow up with your baby’s medical and surgical needs. For more information about care for your baby’s heart, visit NationwideChildrens.org/Heart.